Enjoy extra savings off your next holiday with the Easy Jet Price Match Guarantee. If you find the same holiday for less, Easy Jet will match it and take £15 off. Where do I use my easyJet Holidays voucher code? You will be taken to the payment details section where you can enter your Voucher. On the right of the screen, you will see a box with “Enter Code”. Enter it here and click apply. Your holiday price will automatically be updated. An estimated 70 million passengers fly with easyJet Holidays each year, making them one of Europe’s leading airlines. An estimated 300 million people live within a one-hour drive of an easyJet airport, making it not only an affordable airline and holiday provider but an accessible one too. When it comes to low-cost flights, cheap package holidays and the very best destination choices easyJet Holidays is the perfect option. 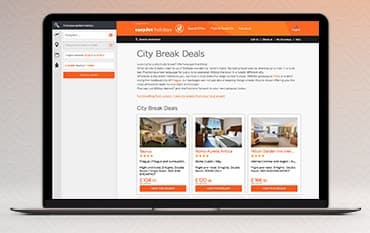 From cosmopolitan city-breakers looking for boutique hotels to sun-worshipping holidaymakers looking for luxury escapes; everyone can find an adventure with easyjet Holidays. EasyJet holidays gives you all the freedom to plan and create the holiday you really want, with the straightforward, all-in-one booking to make your holiday run smoothly. No frantic searching through your email inbox to find hotel and transfer reservations, just one, all-inclusive booking. Select your flights, before selecting the hotel, transfer, car rental or insurance you require. Unlike other package holiday travel operators, none of these are compulsory additions to an easyJet Holiday package - so you can create and pay less for the holiday you really want. Easyjet Holidays knows it is very important to feel protected when booking your holidays. Feel completely secure on your easyJet Holiday with the ATOL protection scheme that they offer on their online bookings. All the holidays sold in the UK on the easyjet Holidays website are financially protected by the ATOL scheme, so you can book with confidence and reassurance. Easyjet Holidays offer a wide range of different ski holidays from 5-star luxury ski getaways to 3-star and 4-star great value ski breaks. Whether you’re looking for a boutique ski hotel or a last minute ski holiday, at easyjet Holidays you can find a wide range of options to suit you. Discover the top ski resorts and the most affordable options and enjoy a fantastic, fun-filled ski holiday any time of the year. And, now you can make the most of the low deposit scheme too. Book your ski holiday for just £60 deposit per person and pay the remainder of the trip price 45 days before your departure. So whether you’re after a ski break in a luxury French ski resort or in the snowy peaks of Bulgaria you can find it and enjoy it for less with easyjet Holidays. In the special offers section, you can find bargain holidays to destinations all over the world including Majorca, Benidorm, Malta, Paphos, Tenerife, Amsterdam, Paris, Rome, Reykjavik and many more. Fly from a number of UK airports such as London Gatwick, London Stansted, Glasgow, Manchester, Belfast and much more and enjoy a low-cost holiday or city break of your choice. In the special offers section, you can also find last minute holidays, ski holiday deals, city breaks, winter sun deals, school holiday breaks, all inclusive deals, beach holidays, luxury holidays, family holidays and even cycling holidays as well as 4* and 3* offers. What is the baggage allowance on Easyjet flights? With all Easyjet flights you're allowed one small cabin bag that's a maximum of 56x45x25cm. You can also bring an additional under seat bag like a laptop bag or a handbag with a maximum size of 45x36x20cm. If you require hold luggage for a longer haul holiday you can choose from 15kg, 23kg and 32kg of luggage, depending on how much you think you’ll need. Each customer including children and infants can buy allowance for up to three hold bags (a standard hold bag is 23kg). And, if you’re travelling with family or friends on the same flight and booking, you can combine your total weight allowance to ensure nothing gets left behind. Click here for more information on all this and more. If you want to cancel your booking, you must contact easyjet Holidays as soon as possible in writing by sending an email to cancellations@holiday.easyjet.com. You must ensure all names and details are entered correctly at the time of booking. Please notify easyjet Holidays as soon as possible in writing if there is something that you need to correct, or if you don’t receive a booking confirmation within 48 hours of making your booking. You can also send your question using the online form. EasyJet Holidays is well known for providing low-cost flights and accommodation to and around destinations across Europe, North Africa and the Middle East so that everyone on every budget can enjoy. Whether you’re looking for a romantic city break or a family holiday in the sun you can find flights and hotels that are affordable, without compromising on quality. Cut the cost of your booking down even further with an easyJet Holidays promotional code, and save your money for your spends once you arrive at your destination. We are constantly on the hunt for Promo Codes for easyJet Holidays to help you with your money saving. Our experts check dozens of sites for secret codes including NHS discounts, student sites & social media channels saving you time & money!